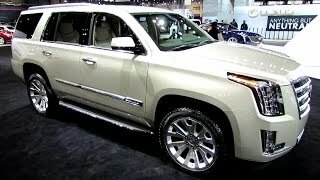 This entry was posted in Large and tagged 2014, 2015, Auto, Cadillac, Chicago, Escalade, Exterior, Interior, Show, Walkaround on April 20, 2014 by Sam. ugh, this doesnt even look like a truck. it reminds me of a station wagon. sooo ugly and square, looks like a hearse. I can already see all the rich coke dealers Rollin around in these lol.